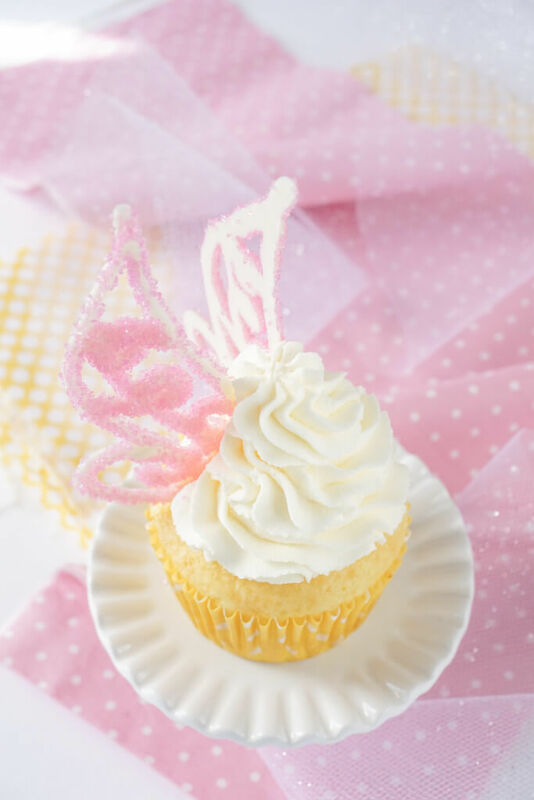 These Lemon Cheesecake Tinker Bell Cupcakes are made with just 5 ingredients and finished off with homemade white chocolate fairy wings! Growing up as a Disney kid, I, of course, had my favorite characters. I look like Belle or Snow White, and I loved Pocahontas’ bravery, but when it comes down to it… my personality is all TINK! Stubborn, sassy, independent and a wee bit jealous! (Right about now my mom is probably shaking her head up and down thinking “YUP.”) But at the end of the day, Tink is smart and kind and helpful, and when it comes down to it, that’s what matters. I don’t get too whimsical all that often, and I post kid geared recipes even less so. 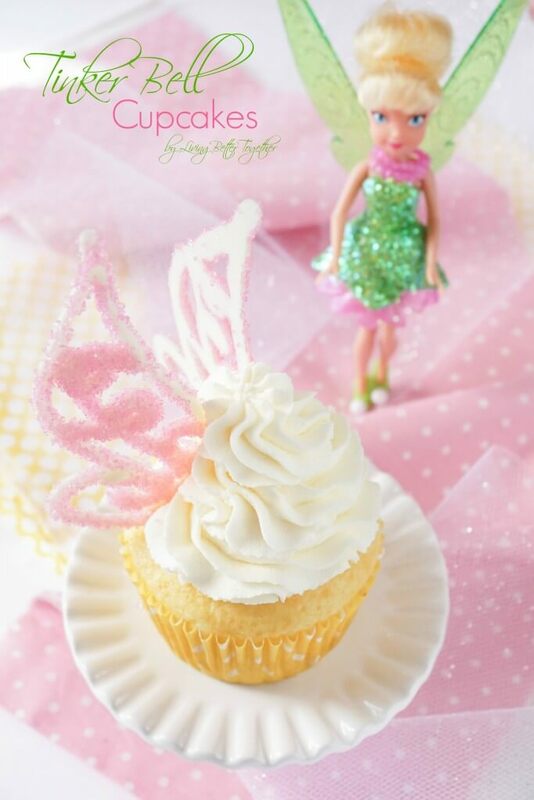 However, these Fairy Cupcakes were an idea that I just couldn’t let slip by and with the new Tinker Bell and the Legend of the NeverBeast movie coming out this month, it was perfect timing! Speaking of which, have you seen the NeverBeast? His name if Gruff, he’s like a much cuter (and way less creepy) version of Falkor the Luckdragon. It’s like two of my favorite childhood things combined! This movie is WINNING on all counts! I wanted to keep the cupcakes themselves really easy for moms on the go that want to do something fun for a NeverBeast viewing party or birthday party. 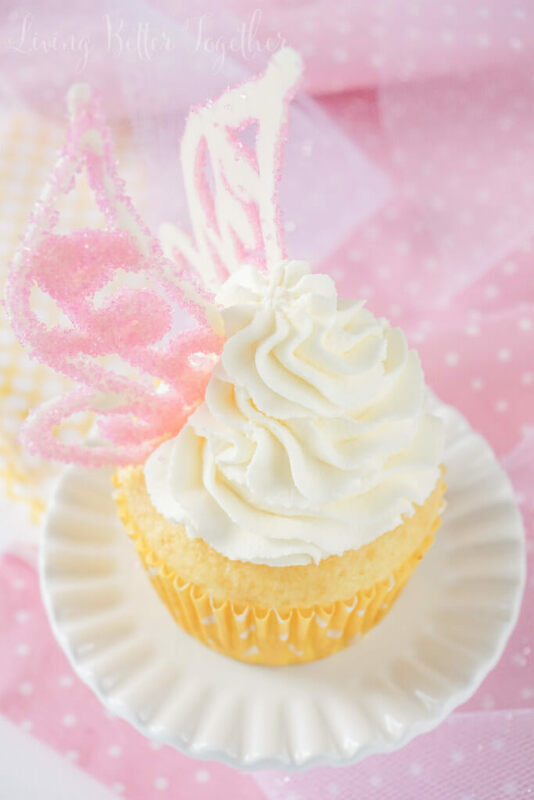 These Lemon Cheesecake Cupcakes are made with just five ingredients and then finished off with these ADORABLE white chocolate fairy wings covered in sugar sprinkles! Add white chocolate to a microwave safe bowl and heat on high for 30-second intervals, stirring in between each one, until fully melted. With the assistance of a spoon, pour melted white chocolate into bottle and screw on the cap. Lay wax paper over the printed fairy wing outlines, I just searched for mine on google images. 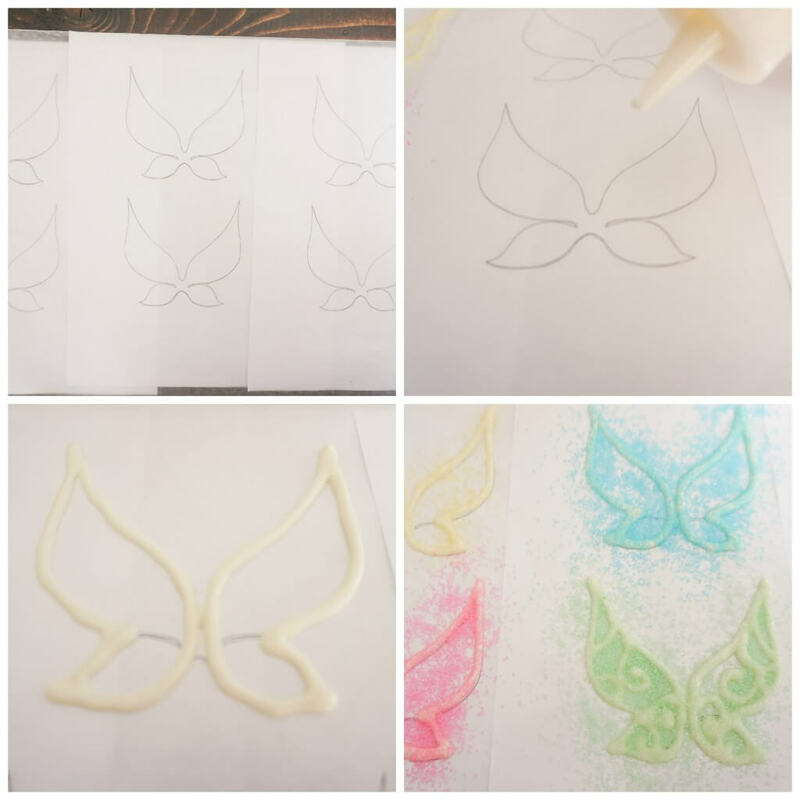 Carefully draw the outline of the wings using the printout as a guide, make sure the two wings DO NOT connect in the middle. Sprinkle each wing immediately with the sugar sprinkles after it’s drawn, do not wait until you’ve drawn out all of them or the chocolate will have hardened. Should chocolate begin to harden and thicken in the bottle, remove lid and microwave for 10 seconds. Let wings set until fully hardened, about 30 minutes, and then gently peel the wax paper away from the back of the wings one at a time. The wings are fragile but will hold up for days as long as you’re careful. Stick into the frosting of the finished cupcakes as pictured. Fill cupcake liners about ¾ full of cupcake batter. Bake for 15-18 minutes until toothpick comes clean, and cupcake tops spring back when touched. Combine heavy cream, confectioners’ sugar, and dry cheesecake pudding mix in a stand mixer and beat on medium-high speed with a whisk attachment until light and fluffy, about 2-3 minutes. You may need to scrape down the sides half way through. 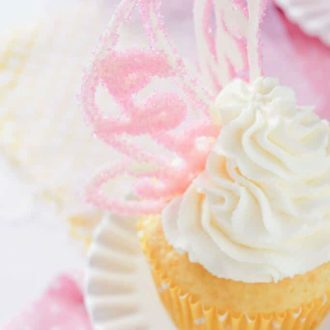 Pipe frosting onto cooled cupcakes and finish off with white chocolate fairy wings. Those turned out so beautiful! I love the colored wings, too! Thank you, Wendy! 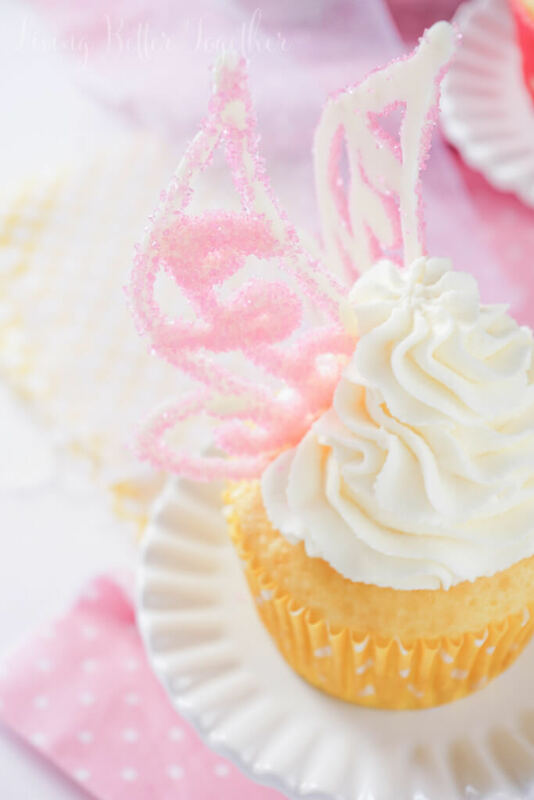 The wings were so much fun to make and I love how they dressed up the cupcakes! Sorry about that, I’ve been changing my recipe cards over to new ones and some of the fractions have been replaced with ?, it should be 1/3 cup.